Bagan is a 42 sq km wide plain by the Ayeyarwaddy River, dotted with over 2000 pagodas of different shapes and sizes. The city was the capital of the Kingdom of Pagan between the 9th and 13th Century, where it was one of the most important political, economic and cultural centres during the Pagan Empire. Over 10,000 temples were built during 11th and 13th by the wealthy and ambitious Pagan rulers. Today, only an estimated 2,200 are left standing after a series of invasions (by the Mongols), earthquakes and erosion. Today, Bagan is one of Myanmar's top tourist destinations, with picturesque landscapes and breathtaking sunrise and sunset views. There are few or no signages about elaborate history and information about the temples - do not hesitate to ask the locals to explain the story behind each pagoda to you. I’ve met some of the most hospitable and friendly people there. We met Aung Aung Oo, a tour guide at Ananda Temple. Bagan is his hometown, and he is extremely passionate about sharing his knowledge of its history, economy, as well as all the secret, non-touristy spots! After our guided tour around Ananda temple, he joined us on our electric scooters and took us to different temples, explaining bits of Bagan history along the way. We finished the (extended) tour at a less touristy pagoda which offered an amazing sunset and dusk view. We invited him for dinner at a Myanmar restaurant where we learnt more about his life in Bagan as a tour guide (with a recent degree in Bagan History) and as a loving brother to 3 sisters. He also explained to us the stereotypes and perceptions that exist between Burmese people from different cities/towns (eg. Yangon vs Bagan), and different social classes. For example, he explained the income inequality that exists between the common 'everyday' Burmese people and the rich 'cronies' (a term often used in Myanmar to describe rich individuals who have shady connections with Burmese Generals and politicians). His stories have been humbling and inspiring. We still keep in touch on social media today. 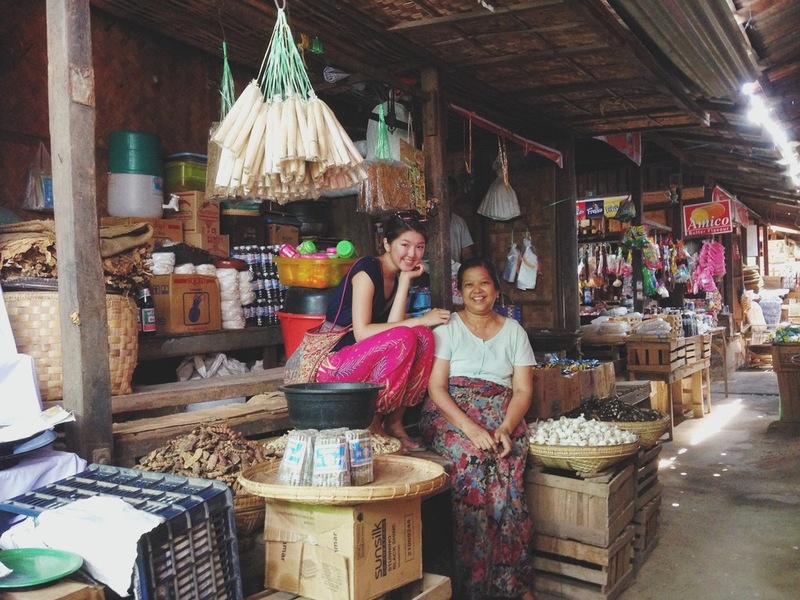 You might also encounter a lot of Bagan children who would want to sell you souvenirs like lacquer-ware and handicrafts. From my experience, I found that they were very keen to collect foreign coins, so it might be a good idea to bring some of your local coins prior to your Bagan trip! They collect foreign coins from the tourists they meet in Bagan as their way of ‘seeing the world’. This was definitely one of the most memorable places that I have been to. My brothers and I were brought up as Buddhists, where we would pray at Burmese Buddhist temples in Penang. Bagan for me was like a Catholic visiting the Vatican or a Muslim visiting the Mecca for the first time. I will never be able to describe the peacefulness and spiritual fulfilment I felt when I was there. All in all, religious or not, Bagan has some pretty sick views which cannot be found anywhere else in the world - I highly recommend Bagan as a place to visit before you die! Bao and I swarmed by locals who jumped off two different trucks to take pictures with us. I visited Bagan during July-August (wet/ rainy season) for 4 days/ 3 nights. While there was enough time to cover most of the major attractions, I wish I had more time to visit more pagodas, as well as the local museum. It did not rain much in Bagan even though I was visiting during the rainy season. Bagan is known to remain relatively dry (with the occasional heavy downpour) even during the rainy season. One of the biggest benefits of traveling during this time is the fewer number of tourists. Domestic bus journeys to Bagan will stop Nyuang-U Bus Terminal. Upon arrival you can choose from 3 main modes to your accommodation (slowest to fastest mode): trishaw, horse cart, taxi. Pre-booking is not necessary. Because modes of transport like trishaw/ horse cart do not use an electric meter, be wary of locals who might charge an exorbitant amount for their service. Ask around for the best price as some locals are known to overcharge tourists for their service. You have to pay a tourist admission fee at the Bagan border before entering the protected site. You will be issued a ticket which you are advised to keep throughout your time there. This is a one-time 10-15 USD fee that will apply to all conservation, heritage and archaeological sites in Myanmar (E.g. Bagan, inle lake). Forget the taxis, renting a car, cycling (takes WAY too much effort). This is my only choice of getting around Bagan, excluding a one-time horse cart experience. You can rent an electric scooter from most Bagan Hotels or town centre bike rental shops. I paid 8,000 kyatts (8 USD) to rent a scooter for a full day (8hrs). For someone who still has not obtained her driver’s license (lame, I know), the best part was that I did not need a driving license to drive a scooter. NEW BAGAN, OLD BAGAN, OR NYUANG-U? This is a frequently asked question when it comes to choosing where to stay in Bagan. New Bagan: Relatively fewer things to do in New Bagan; location is not too convenient as it is far away from the main areas of attraction. Accommodation is cheaper than in Old Bagan. Old Bagan: The most expensive place to stay out of the three locations; you are staying amidst all the temples and main sights. Nyuang-U: Recommended. Moderate accommodation cost. You can get to Old Bagan easily (not too far away), visit the market in the day, and hang out at the restaurants/bars in the town center at night. I had a very pleasant stay at Amazing Bagan Resort which is located next to Bagan Nyaung Oo Golf Club. It is a 10-15 min electric scooter ride to Nyuang-U town centre, a 10 min electric scooter ride to Old Bagan (where all the major pagodas are at), and really close to Shwezigon Pagoda and local café/ restaurants. Also, great customer service and good facilities: wifi, bike and car rental service, etc. If you’re interested in having Aung Aung as a Bagan tour guide, you can FB message or call him on his mobile. He takes a few day to reply on FB message. He does not charge a fixed fee, instead he insists that you can pay as little or as much as you like. Aureum Palace Hotel is one of the most famous 5-star hotels in Bagan. If you are a student on a budget like me, and not willing to stay in such a lavish hotel, you can just pay 10 USD to access the hotel's swimming pool. Hotel guests do not have to pay to use the pool. This pool has unobstructed views of the Bagan plains. It is also an ideal place to catch the sunset. Nyuang-U market is a typical local marketplace: DIY timber structure with a zinc roof cover, and some plastic sheeting for further waterproofing. Other than agricultural produce and foodstuff, you can find traditional craft goods like lacquer wood kitchenware, paintings, bags, clothing... which are great for souvenirs. Remember to haggle! The people make these markets so enjoyable to visit. As I have mentioned in other posts, Burmese people are known for their warmth and hospitality. Bao and I spent an afternoon there chatting and hanging out with the locals. We learnt about life in Nyuang-U and took photos with them. Do not be afraid to start a conversation with them because they are more than happy to interact with foreigners. I asked one of the local shopkeepers where the locals go to for authentic Burmese food. She immediately but gently grabbed my hand and led me to Shwe Myat Tar, a shop house cafe located in a less concentrated area of the Nyuang-Yu market. This is a family-run café where they serve yummy traditional Burmese food. It’s funny how, upon our arrival, the family just started bringing out dishes of rice, soup and a selection of Burmese curries/ small plates without us even selecting from a menu of some sort. The entire meal only cost us <5 USD. Ask the locals/ shopkeepers where they go for lunch - Burmese people are friendly and more than happy to point you in the right direction. Since there is nothing to do in (Old) Bagan when night falls, the best thing to do is head down to Nyuang-U town centre for dinner and drinks. 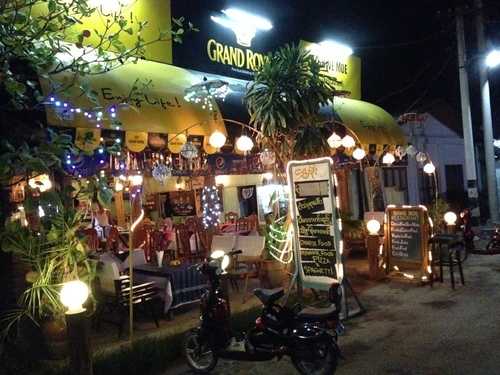 You can find quite a few simple and cosy restaurants in Nyuang-U town centre which serve Burmese and Western cuisine. There are also some local bars and nicely decorated touristy bars. I did not get to do this as the hot air balloons only fly in the cold season. This is definitely something I would recommend if you are travelling during the cold season. Balloon rides in Bagan start from 300 USD per person. Balloons over Bagan is one of the more prominent companies that provide the hot air balloon service in Bagan. With over 2000 pagodas in Bagan, it may be overwhelming deciding which temples to visit. There is no way you can visit all of them in a few days. My recommendations for first-time travellers to Bagan are to visit the main pagodas (as listed below), and to plan your visits around sunset and sunrise timings. There are certain pagodas that have better sunrise/sunset views than others. Ananda means "bliss" in Pali and Sanskrit. The pagoda is known for its iconic roof where there are 4 'giant' Buddhas on each of the 4 faces of the roof. Inside the temple are 4 giant Standing Buddhas, each in a separate room facing North, South, East and West. Tour guides in the pagoda usually point out how you can see the Standing Buddha’s different facial expressions when viewing it from different angles of elevation. The wall that encircles the insides of the pagoda also showcases a pictorial history of Buddha's life. Shwesandaw pagoda provides one of the best sunset views in Bagan. It is one of the more 'touristy' pagodas, so be sure to get there early before sunset before it gets too crowded. The Shwezigon is one of the oldest Pagodas in Myanmar. It is an important Buddhist Pilgrimage site because it is believed to house Siddartha Gautama's tooth and bone. Shwezigon Pagoda's architecture is very similar to Yangon’s Shwedagon Pagoda. It sits in the main temple courtyard. I love Schwezigon for its long symmetrical walkways and bejewelled walls with fragments of mirrored glass. Dhammayangyi is the largest pagoda in Bagan. This is my favourite pagoda because of all the myths and stories that are attached to it. There is a twisted history behind this pagoda which is notorious for being ‘haunted’. Apparently Dhammayangyi was built by a crazy king who not only murdered his family members, but also chopped off the hands of the labourers who did not build the temple properly. A caution for people who are terrified of bats as this pagoda is FILLED with crazy bats swooping about, as well as many dead bats on the floor. 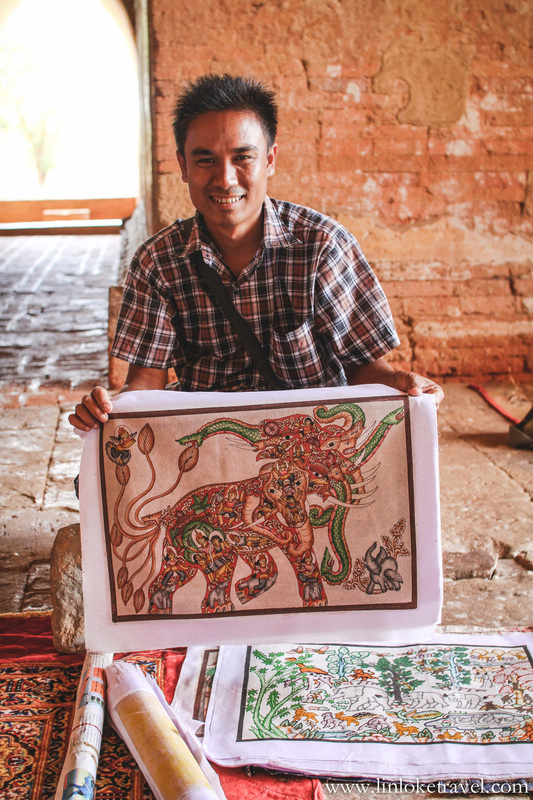 I bought a few traditional sand-painted art pieces from an artist who was trying to sell me his work in the Dhammayangyi temple. It’s funny how most of the local artists also offer complementary 'tour-guide services' around the temple that they sell their paintings in. Mingalazedi Pagoda, a small-sized Pagoda, is considered a good alternative to Shwensandaw for sunrise/ sunset views if you want to avoid the crowds. NOTE: Climbing pagodas in Bagan have been banned since I first wrote this post in 2014. Apparently tourists will not be permitted to climb all but 5 of the biggest Bagan Pagodas. It might not be possible to access the peak of some of the Pagodas mentioned above. Traveling in Bagan with my bestie, Bao, prior to the pagoda-climbing ban.